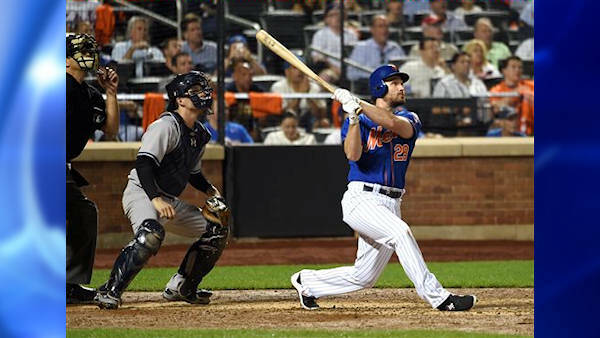 NEW YORK -- Lucas Duda, Daniel Murphy and Juan Uribe each homered, and closer Jeurys Familia shook off the Yankees' best shot in the ninth inning to help the New York Mets to a 5-1 victory Friday night in the opener of the Subway Series. Rookie Steven Matz (4-0) outpitched Masahiro Tanaka (12-7), and Familia escaped his own bases-loaded jam by fanning Chase Headley for the final out at Citi Field. This was the latest regular-season matchup between the teams, and the NL East-leading Mets held their eight-game lead over Washington with 15 to play. The Yankees fell 4 1-2 games behind AL East-leading Toronto, which beat Boston 6-1. Matz (4-0) overcame a wild start to pitch six gutsy innings, working around seven hits. Alex Rodriguez, Jacoby Ellsbury and Brian McCann didn't start for the Yankees - who outhit the Mets 9-8 - but all of them got into the game. A-Rod walked as a pinch hitter with one out in the ninth to put runners on first and second. Ellsbury then grounded a shot off Familia's leg that caromed into foul territory for a single that loaded the bases. Familia showed he was OK with a warmup pitch, then he retired Brett Gardner on a flyball and struck out Headley. Tanaka gave up two runs and five hits in six innings, and left after throwing only 82 pitches. Duda and Murphy hit solo home runs off the Japanese star. The second-largest crowd in Citi Field history of 43,602 was abuzz from the start in the most meaningful games between the teams since the Yankees beat the Mets in the 2000 World Series. New York has been a pinstriped city for two decades but the Mets appear to be poised to light the Empire State Building orange and blue this fall thanks to a staff of young aces and a rejuvenated offense behind trade-deadline addition Yoenis Cespedes. A foundering offense into July, the Mets have taken off since the arrival of Cespedes, Uribe and Kelly Johnson. Uribe hit a two-run shot as a pinch-hitter in the seventh to open a 4-1 lead. The drive was the team's 29th in the past 17 games. Four Mets pitchers, meanwhile, ended the Yankees homer streak at 11 games. Mets manager Terry Collins talked about his young players gaining big-game experience in this set that would be helpful for the amped-up postseason. Matz, however, looked unsettled at the start. He walked Gardner leading off the game and allowed Chris Young's sacrifice fly. Matz gave up two more hits in the second, needing 43 pitches for the first two innings. He could be seen in the dugout during the bottom half shaking his head and muttering to himself. The 24-year-old from Long Island settled in nicely, yielding just three singles over the next four innings. Murphy sent a two-out, full-count pitch from Tanaka into the Yankees bullpen for a 2-1 lead in the bottom half. Duda's homer in the first was his first longball since Aug. 2, a span of 19 games. It ended a scoreless streak by Yankees starters at Citi Field at 21 2-3 innings, dating to May 28, 2013. Yankees: RHP Nathan Eovaldi (elbow inflammation), shut down since last pitching Sept. 5, says he's feeling much better. He will play catch for first time on Monday. He thinks if he makes it back during the postseason he would be able to help out of the bullpen. Mets: LHP Dario Alvarez (left groin) was headed to the team's complex in Port St. Lucie, Florida, to rehab. Yankees: Michael Pineda is 1-1 with a 5.82 ERA in four starts since returning from a forearm muscle strain. He's thrown 14 scoreless innings in two starts in NL ballparks, both with Seattle. Mets: Noah Syndergaard is set to make his 22nd career start, the second straight Mets rookie to get the ball in this series. In 10 starts at Citi Field, he is 7-1 with a 2.15 ERA.